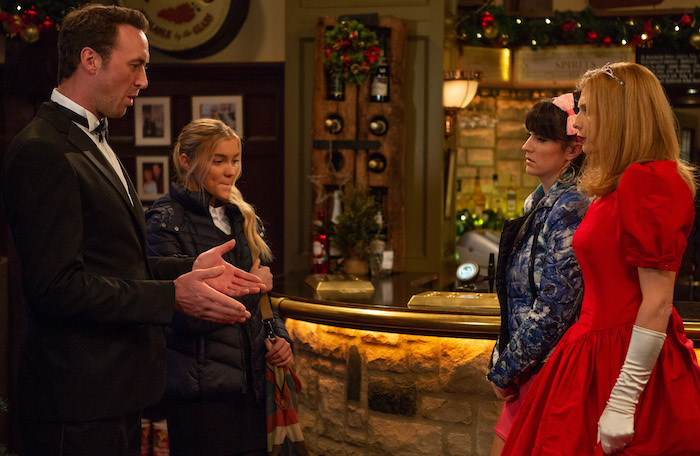 Mon 26 Nov 2018: Gabby Thomas and Leanna plot to break Liam Cavanagh and Bernice Blackstock up. 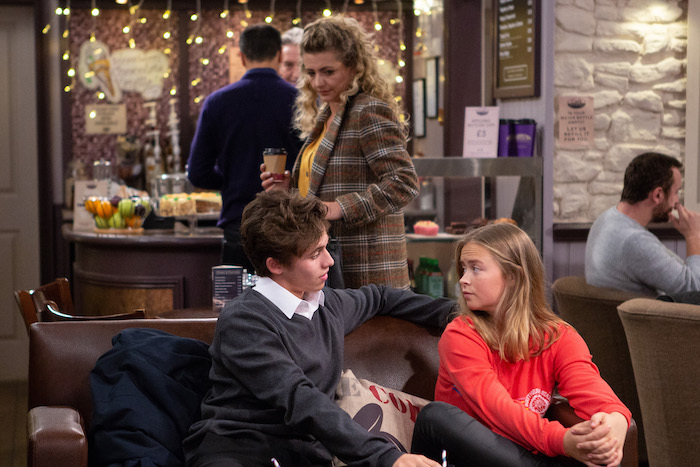 Mon 26 Nov 2018: What do the terrible teenagers have in store for lovebirds Liam Cavanagh and Bernice Blackstock? 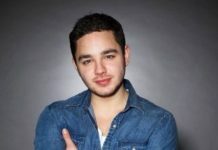 Mon 26 Nov 2018: Gabby Thomas starts by telling Liam how Bernice expects commitment, leaving him feeling slightly uneasy. 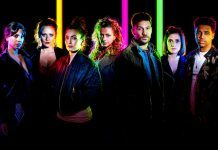 Mon 26 Nov 2018: The Con is on! 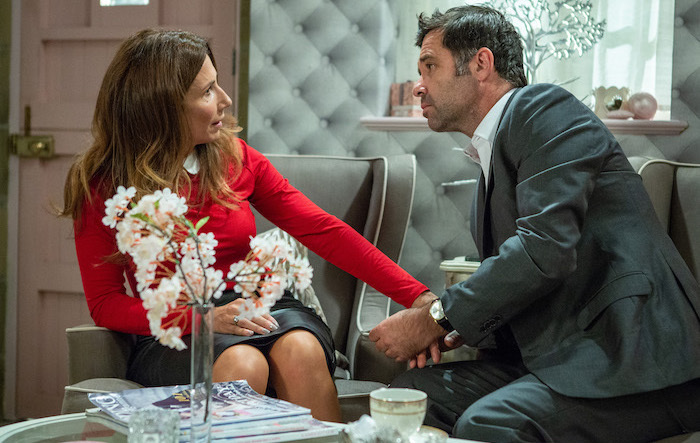 But has Clive filled Leyla Harding on the full extent of his plan? 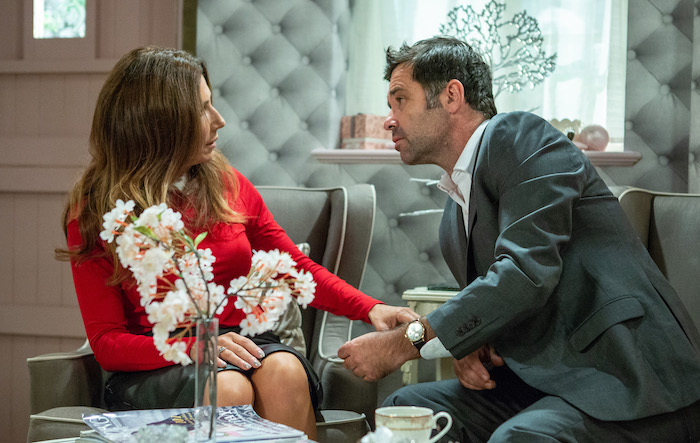 Mon 26 Nov 2018: Leyla Harding is left furious when she realises Clive is wanting to stitch Frank up and flee the country. 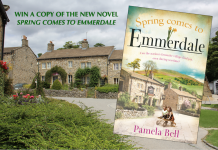 Mon 26 Nov 2018: What will Leyla Harding do? Will her conscience lose her the man she loves? 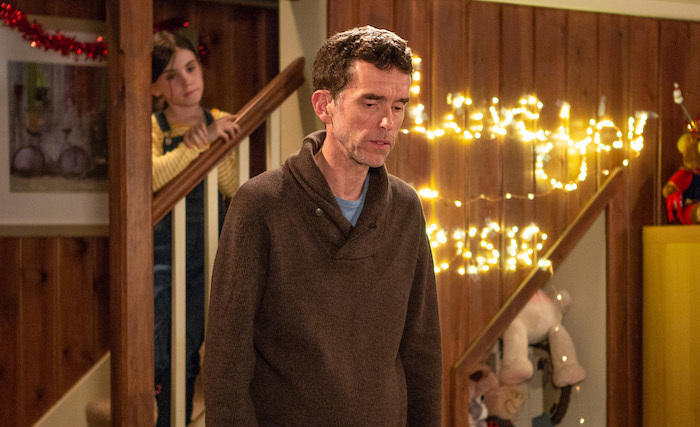 Mon 26 Nov 2018: As Marlon Dingle and April Windsor decorate the Christmas tree, April talks about love. 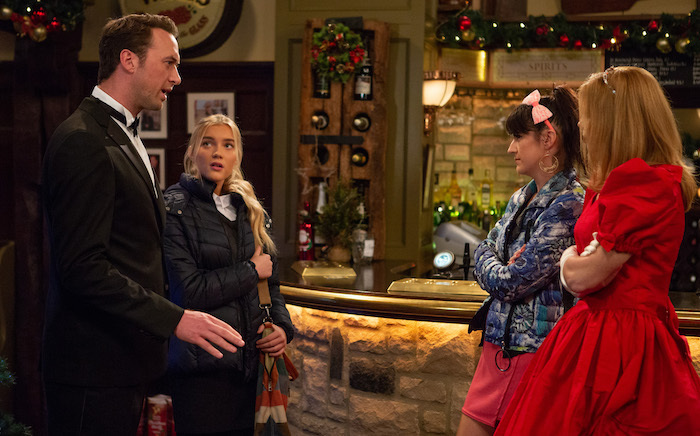 Mon 26 Nov 2018: Marlon Dingle’s gesture throws Jessie and she leaves in a rush, winding Marlon. 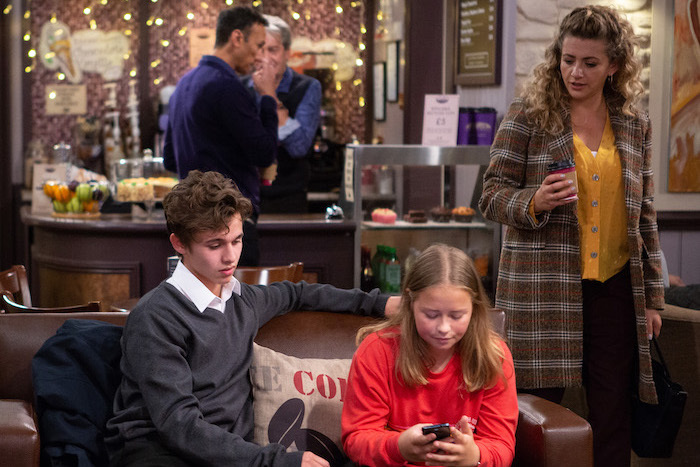 Mon 26 Nov 2018: What does the future hold for Marlon Dingle and Jessie Grant? 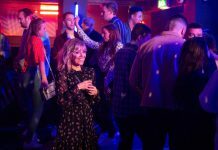 Tues 27 Nov 2018: How will Megan Macey react when she finds out about Frank and Clive’s con? 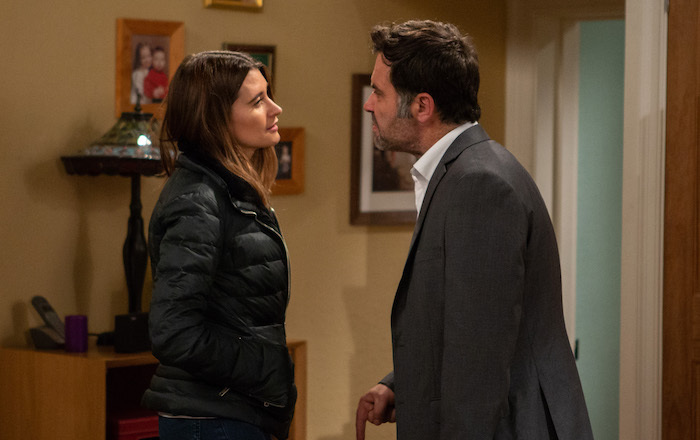 Tues 27 Nov 2018: Megan Macey is furious and tells Frank they’re finished but is Leyla set to lose all also? Wed 28 Nov 2018: Leanna Cavanagh convinces Bernice Blackstock she has made the wrong choice of dress for the gala. Wed 28 Nov 2018: Bernice Blackstock rushes into town to amend her mistake. 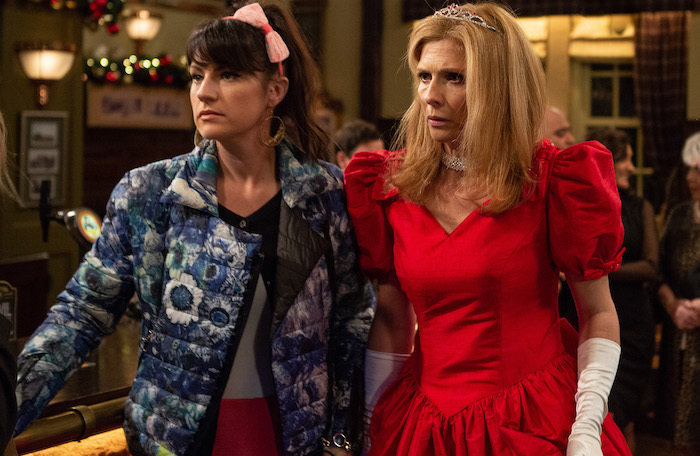 Wed 28 Nov 2018: Bernice Blackstock arrives in the Woolpack wearing an awful ball gown. 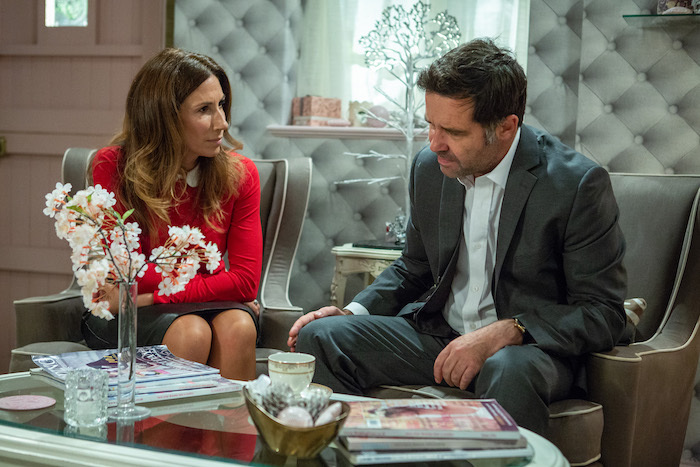 Wed 28 Nov 2018: Bernice quickly realises Leanna has set her up and is left upset when Liam Cavanagh sides with his daughter. 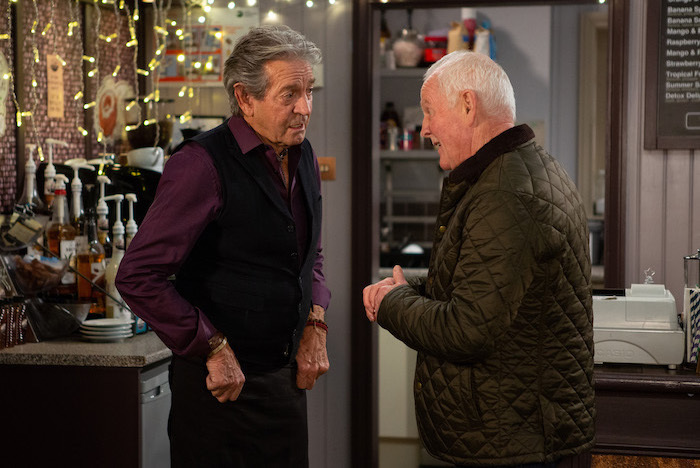 Wed 28 Nov 2018: Pollard comes up with a plan to protect his bromance with Rodney Blackstock. Wed 28 Nov 2018: Rodney Blackstock fakes an illness so he can stay with Pollard. Will Faith soon be on to the pair? 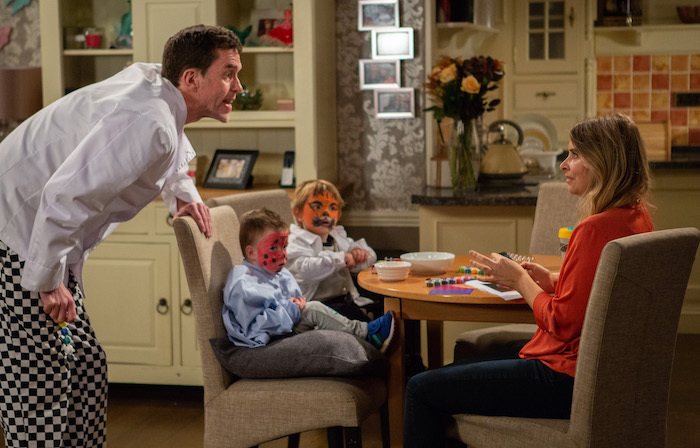 Thurs 29 Nov 2018 – 7pm: Charity Dingle is left to entertain Moses and Johnny but is horrified when she realises she’s used permanent paint on the kids’ faces. 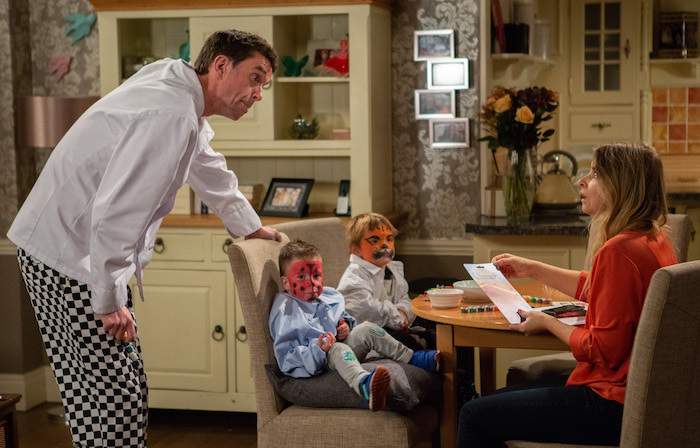 Thurs 29 Nov 2018 – 7pm: Marlon Dingle helps Charity Dingle to find a way of getting the paint off the kids’ faces before Vanessa arrives. 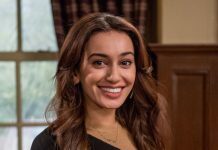 Thurs 29 Nov 2018 – 7pm: Megan Macey spots Graham Foster and attempts to talk some sense into him. 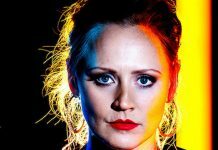 Thurs 29 Nov 2018 – 7pm: Graham Foster misinterprets Megan Macey’s kindness. 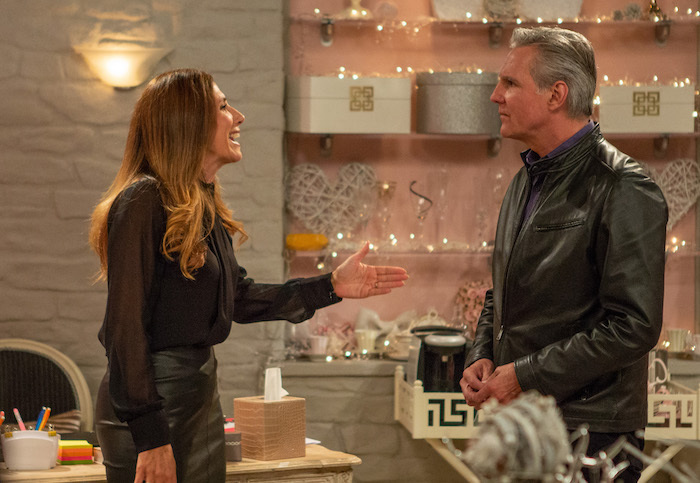 Thurs 29 Nov 2018 – 7pm: Megan Macey is shocked when Graham Foster tries to kiss her. 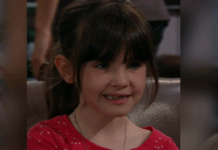 Thurs 29 Nov 2018 – 7pm: Megan Macey pulls away leaving Graham Foster utterly mortified. Thurs 29 Nov 2018 – 8pm: As they reach Butlers Farm, Graham Foster tells Noah Dingle this is where he’ll find his answers about Joe. 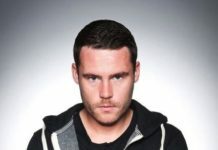 Thurs 29 Nov 2018 – 8pm: As Debbie Dingle answers the door she’s shocked to see a dishevelled Graham. Thurs 29 Nov 2018 – 8pm: Debbie Dingle is shocked when Graham implies Cain knows more about Joe’s disappearance than he is letting on. 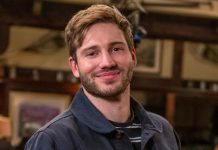 Thurs 29 Nov 2018 – 8pm: Will Graham Foster reveal Cain’s secret to Debbie and Noah Dingle? 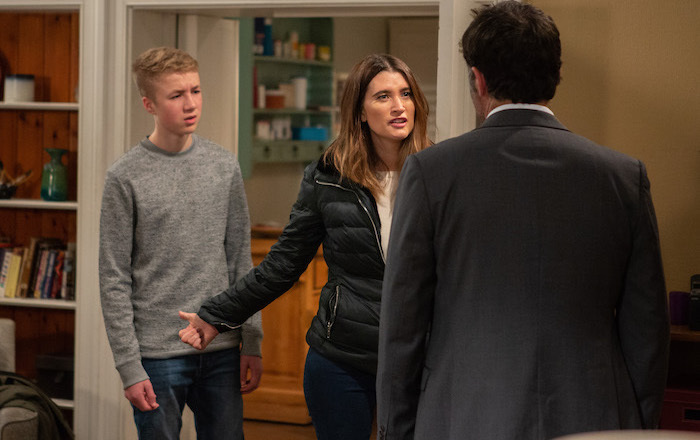 Fri 30 Nov 2018: Maya overhears Jacob Gallagher asking Liv to go to the cinema with him. 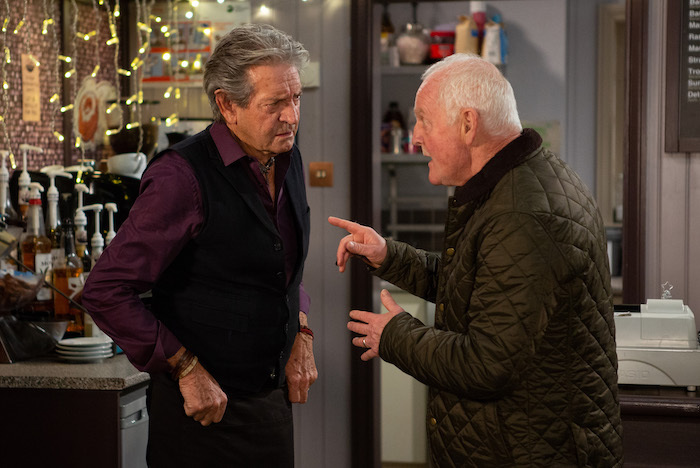 Fri 30 Nov 2018: Meanwhile, Jacob becomes angry when David tries to give him relationship advice. 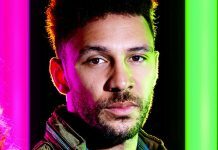 Fri 30 Nov 2018: Maya realises Jacob Gallagher’s feelings for her are stronger than ever. 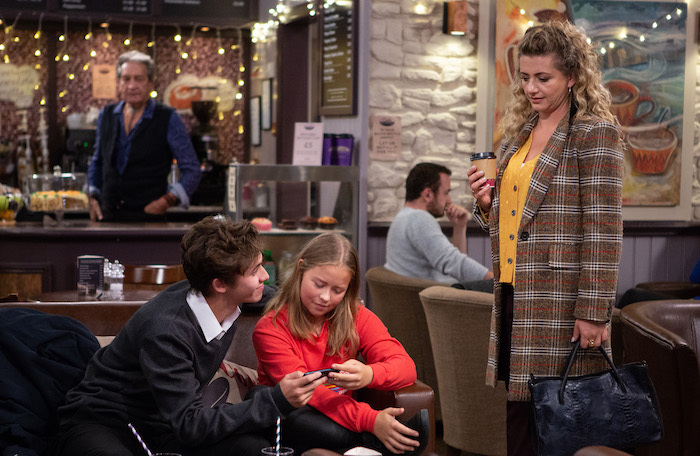 Fri 30 Nov 2018: Vanessa Woodfield happily agrees when Charity Dingle moots the idea of them living together. Fri 30 Nov 2018: Vanessa Woodfield and Charity Dingle are excited to start looking for a place together.